Key West, Florida is known around the world as an oasis of natural beauty and paradise for those who seek fun in the sun and on the water. It’s also where people from all walks of life are welcome to come as they are – to enjoy the history, the famous nightlife, the art, attractions and of course the quirky locals. But it’s the other side of this tiny utopia that draws a different kind of crowd – the lost souls that were laid to rest, but never truly rested. Discover the city’s darker side when you visit these haunted cemeteries. A visit to this historic cemetery may offer you more than you bargain for. There are more than 100,000 people buried here and many of them are said to still be lingering between life and death. As you stroll through the grounds, enjoy reading some of the more interesting and even humorous headstones. There’s one that reads: “I told you I was sick” and another “Devoted Fan of Julio Iglesias.” But be aware as you wander amongst the graves; you may just run into the spirit of the well-known Bahamian woman who sees herself as the guardian of the graveyard. She’ll only approach you if she feels you’re being disrespectful to the gravestones so make sure if you feel like sitting down, you sit on a bench, not a grave. Visitors have reported this stern ghost approaching them with an angry look upon her face and then disappearing. Other eerie encounters include disembodied voices, shadows and strange orbs of light. Check the photos of your visit too; many guests to the Key West cemetery report various mysterious lights, shadows and figures. 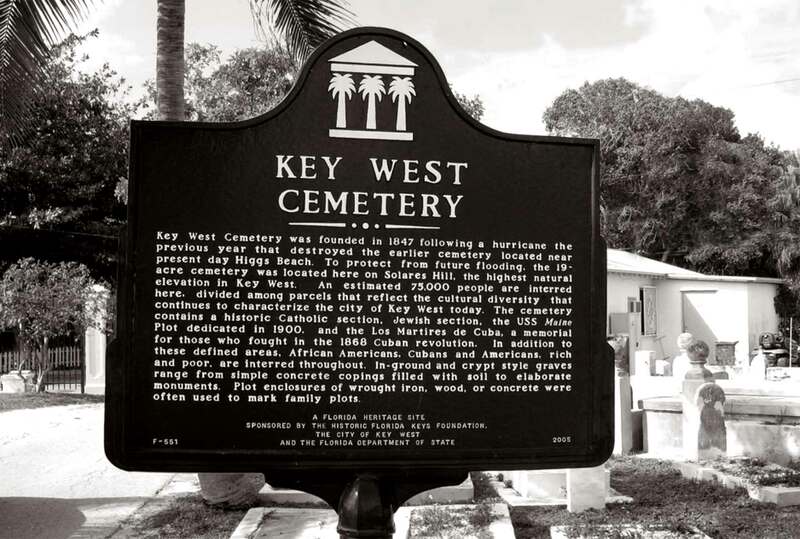 Key West Cemetery is located at 701 Passover Lane in Old Key West. Visit St. Paul’s Episcopal Church Graveyard and see for yourself why many people are convinced this quaint burial ground is haunted. There are not nearly as many graves here as compared to the Key West Cemetery; but it seems there are just as many tortured souls. Keep your eyes open for several of them including a man who appears as a vaporous apparition wearing 19th century attire. He’s not alone though; there’s also an old sea captain that seems to get his kicks spooking visitors. Other hauntingly scary reports include the sight of children gathering around the statue of an angel in the center of the garden. Several visitors have told of hearing children’s voices when none were in sight. Floating, glowing orbs of light, inexplicable sounds and more have also been experienced. Stop in to this small graveyard to find out if the stories are true. St. Paul’s is located on the corner of Eaton and Duval Street behind the church.